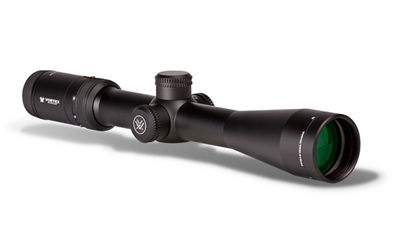 Vortex Viper HS 4-16x44 Dead-Hold BDC Reticle Riflescope VHS-4305 has 4x to 16x power, light-gathering 44mm objective and a unique optical system with magnification versatility at long distances. It is equipped with Dead-Hold BDC reticle on the second focal plane, with a customized hashmark design to remove guesswork on holdover and windage corrections. 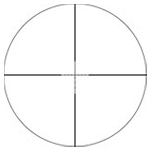 The reticle is great for hunting or shooting at varying ranges. Vortex VHS-4305 comes with a forgiving eye box with heightened eye relief to make shooters get on the target quickly and easily, and renders enhanced windage as well as elevation travel for optimal adjustment. High points include premium HD lens elements with (High Density) extra-low dispersion glass for images with enhanced resolution and color fidelity; XR fully multi-coated air-to-glass surfaces for increased light transmission; ultra-hard, scratch-resistant ArmorTek coating on exterior lenses; highly-prized Argon gas purging for fogproof performance; and O-ring seals for waterproof scopes performance. 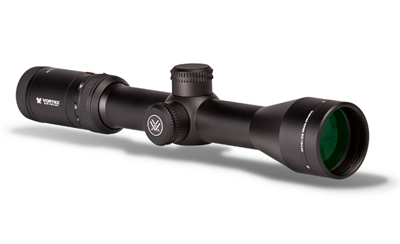 The Vortex Viper HS 4-16x44 Dead-Hold BDC rifle scope is built on a 30mm one-piece tube. It’s state of the art optical system is supplemented with 4x zoom range for enhanced magnification. Other features comprise MAG-view fiber optic, side focus, fast focus eyepiece, Precision-Glide Erector System, Precision-Force Spring System, aircraft-grade aluminum construction, hard anodized finish, etc. In addition to this, it is available with capped reset turrets that allow fast re-indexing of the turret, without any tool, to zero post sighting in the scope. The caps ensure external protection of the turret.